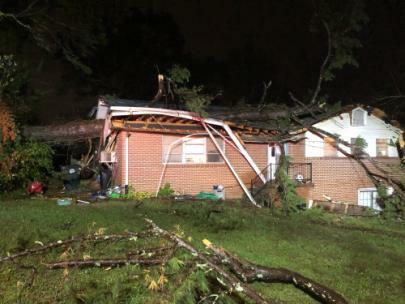 - photo by Battalion Chief David Thompson Jr.
A man was injured early Thursday morning when a tree fell on his house. The Chattanooga Fire Department received the alarm around 3:30 a.m. and responded to 7317 Elaine Circle with several fire companies. 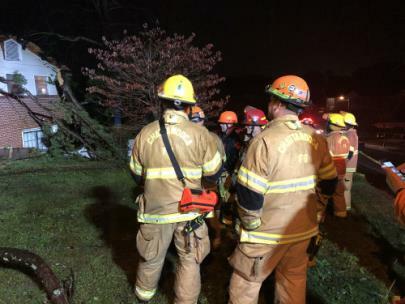 Battalion Chief David Thompson Jr.
said the department's Urban Search and Rescue Team (USAR) was requested in case a rescue was needed, but the entire family, including two adults and several children, were already out of the house when the first firefighters arrived on the scene. Chief Thompson said the father was suffering from what appeared to be a broken arm. No one else was injured. 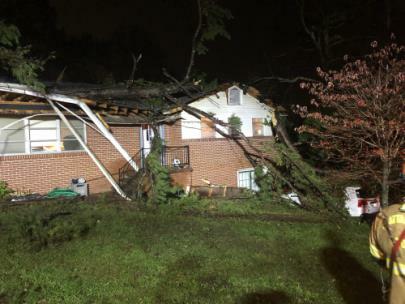 Chief Thompson advised the family that they could not stay in the house until a building inspector surveyed the damage and the necessary repairs were made. However, with firefighters serving as escorts, family members were allowed back in the house briefly to get some essential items, such as medicine and school supplies for the kids.